It is fun to learn about the holiday traditions of friends and family. Especially when it comes to food, I am impressed by traditions from all over the world. Brian’s family has some wonderful traditional recipes, and every year we try to take one old recipe and make it our own. We stick to some aspect of the old recipe such as the food’s look, but vary it with ingredients we like or find locally. Brian’s maternal grandparents have been making these amazing “rum balls” for ages. When we talked to his Grandpa and Grandma a few days ago, they were making these cookies and we had to get the family recipe. Grandpa wasn’t sure how old the recipe was or which of their mothers had carried the tradition over, but it has been in the family for generations and they love making rum balls year after year. Since it involves rum of course, it gets even more fun to make it! Grandma also likes to joke around about how much rum goes into the cookies. In the recipe below, the original version is in parentheses next to my variations. My Double Spiced Rum Balls started with an incredible, fresh Mayan cocoa from World Spice Merchants in Seattle with many spices in it already, which I substituted for regular cocoa powder. We never use corn syrup like the original recipe calls for, and honey would serve the same purpose along with adding a light sweetness, so I used a local mountain wildflower honey in its place. You can substitute corn syrup in almost everything except when you’re trying to use it to make candy of some sort at high temperature and prevent crystallization. In fact, Grandpa said he will try using honey next time instead of corn syrup 🙂 Evolution of traditions for positive change is a good thing! The third ingredient I substituted was spiced rum, the only rum we had on our shelf. All of the above, combined gave the most flavorful touch to this holiday tradition to make it even more festive! Thank you! Grandma & Grandpa, we have had a great time making these and even more fun eating these snow covered rum balls as it snows away in Seattle for days now! You might also like my Peppermint Pistachio Fudge! 1. Put the wafers in a plastic freezer bag you can seal, and bash them up with a rolling pin till you get them finely ground. You can use a food processor as well, but this way is more fun. 2. Roughly chop up the walnuts, which give a crunch to the cookie. 3. Mix the wafers, nuts, and cocoa in a big bowl. 4. Add the honey, mix it up, and then add the rum! 5. Scoop a ball or two with a small cookie scoop or a tablespoon. Roll them smooth into balls with your palms. Grandpa says that if no balls form, then you need more rum! Somehow it is the rum that makes the balls stick together according to his years of experience. This is where the fun begins 🙂 Once the balls are ready, drop them in a shallow dish filled with confectioner’s sugar and roll them around until they are completely covered! 6. Put them in a parchment lined tin and refrigerate. It is better to make them a day or more before you plan to serve or eat them, as that way the flavors really infuse. Perfect cookies for the weather! 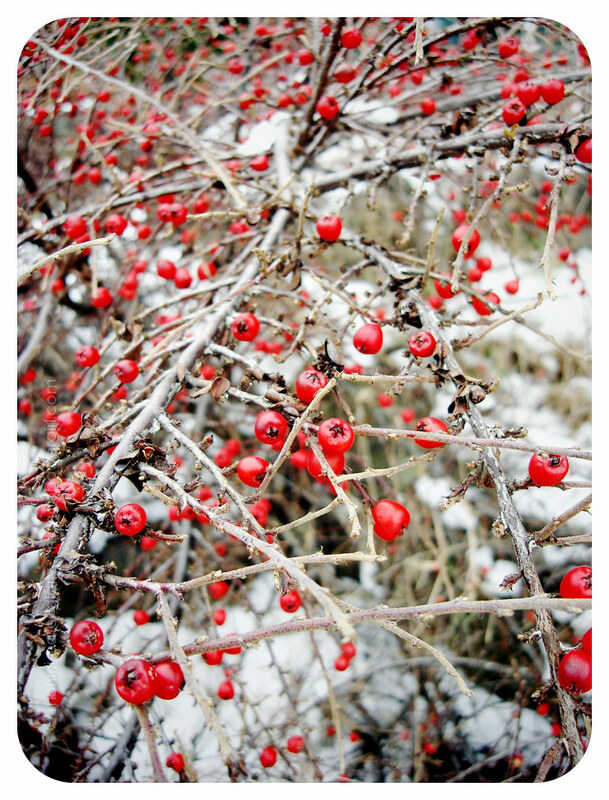 Beautiful pictures, too..hard to miss the resemblance with the snow covered fruit. Just beautiful! 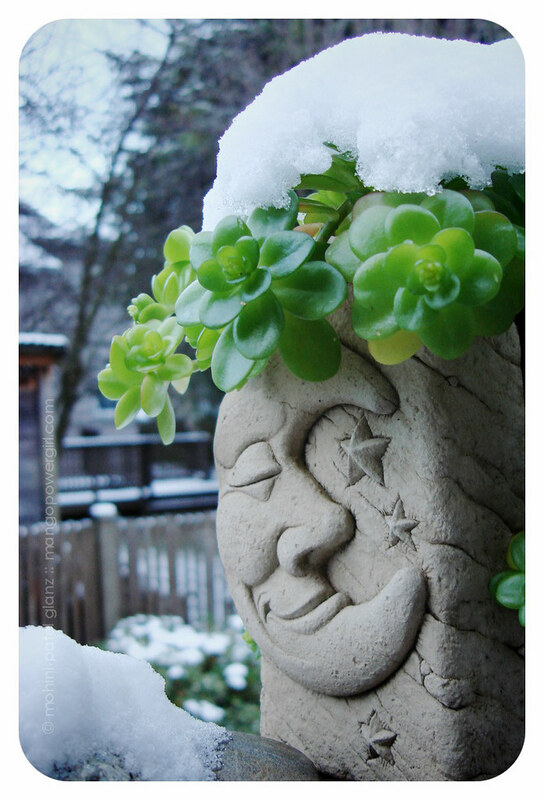 I love the pictures in this post with all that snow! It’s great that you are able to utilise an old recipe and make it partly your own…rum balls are divine! WOW WOW WOW !!! What happened while i was gone girl ?? Your blog looks stunning ! The new header, the new look, the photographs … everything !! !You u’ve been busy Mo i can see that 🙂 The rum balls look to die for. Make some n send ’em to me !! I simply love that you took a classic family recipe, removed all the suspect ingredients and made them all gourmet. Sounds super yum! sigh. I love those snowy pictures. And the rum balls look delicious! oh my gosh, i have the same exact recipe that was passed down to me by an elderly couple that is now in their mid 80’s!!! instead of rum, it actually calls for bourbon, but essentially it’s the same! how about he makes me a tin can’s worth every year and before Christmas week is out, i finish all 30 or so balls! my absolute fave thing to indulge in during the Holidays! First of all, those look AWESOME! 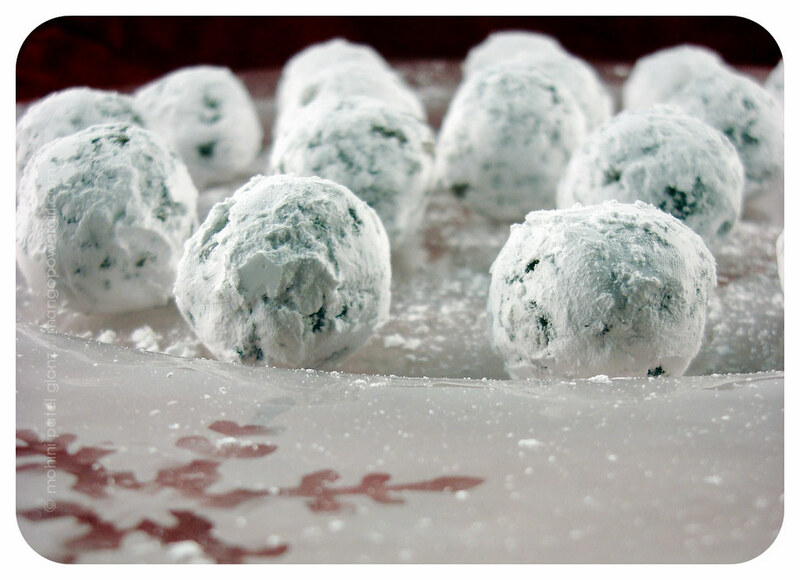 They look so delicious…I love things covered with powdered sugar.Second of all, I came across your blog while doing a search and wonder – have you ever posted the tofu kan recipe? I’m from Ithaca but no longer live there and am dying to make it for myself. No other pressed/marinated tofu is quite as delicious. Please please please? WOW! The photos make me want to go out there and attack!! And loved the pistachio fudge. Wow wow wow..I am a hungry guy at 6 AM :-(Was in Seattle about 10 years ago, lovely city. Great atmosphere.